If you're in the midst of a bathroom design project, your flooring is just as important as picking out a new faucet or a bathroom vanity. One option that has gained steam in many interior decorating circles is cork flooring. This floor covering is not only sustainable, but it will provide a number of unique benefits that makes it ideal for bathrooms, according to MotherEarthNews.com. 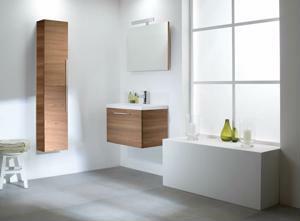 Due to the high amount of moisture in bathrooms, flooring choices will be reduced drastically. Cork flooring has impressive moisture retention and will have to be cleaned a lot less often than other flooring types. As an added bonus, the flooring also provides significant give, which can be a huge benefit for consumers with joint issues who need a low-impact surface. Sustainability is also a huge benefit to cork flooring, as the material is harvested from the bark of cork trees which can grow back quite quickly. This will give homeowners peace of mind that they can reduce their carbon footprints while still appointing their home with a long-lasting flooring type. Flooring is one of the biggest considerations during bathroom remodeling, and it can make or break your aesthetic. Which flooring types are your top choices in your new washroom?